M.K. Ramachandran , different destinations in the Himalaya, Chardham yatra, Puncha Kedar Yatra, Dodi Lake , Roopkhund Yathra, Go Mukh - Tapovan, Kahatling Glaciers of Gangothri Dham, Trisul Peak Satopanith Lake in the Baadrinath Dhami , Garwhal Himalayas, Patal Lokg, Aadikailasam, Om Parvath, Kailash Manasasarovar (Tibet), Almora, Bhageswar, Dharchula, Bhim Tal, Naini Tal, Kumaon Himalayas, Sacred places in Jammu Kashmir Himalaya included Amarnath, Vaishnav Devi, Dhamundi Devi, Jwalamudhi Devi, Ladhak etc. Eastern Himalaya Gagtok, Nathula Pass, Baba Mandir, Khajani Janga, Jeorthang , Glaciers, Himachal Pradesh Himalayan Rangu Kinnor Kailash, Mani Mahesh Kailash, Rothang Pass, Dharmasala, Manali, Delhouru, banks of Satlej, Bhaspa and Raavi rivers , Sources of origin of the sacred rivers: Brahmaputhra, Satlaj, Sindhu, Karnali, Ganga, Alakananda, Mandakini, Saraswathi, Kasi, Ayodhiya, Gaya, Mathura, Vrindavan, Dharaka, Puri, Khamakhya, venues of south India. M.K. Ramachandran was unknown as a writer till he walked the Himalayas. 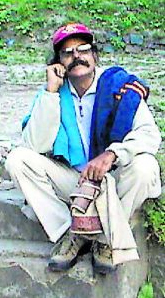 Before he won the State Sahitya Academy award in 2005 for `Uttarakhandilude Kailas Mansarovar Yatra,' his first book on a trek to Mount Kailas through the tricky Uttarakhand ranges, all that he remembers of his literary trials is a couple of short stories that have seen light only in college magazines. Yet, Ramachandran, who now has two popular books to his credit - the one that won the Akademi award and the other, `Tapobhumi Uttarakhand' - says he had no idea that his travels would result in two books that would win him accolades. His trek to the Himalayas was, in fact, to overcome his worries that bogged him from the time he returned from a 15-year banking career in the Gulf to settle in Kerala. Now a familiar name in Malayalam literary circles, Ramachandran is planning his third book - on his journey to Eastern Himalayas and Adi Kailas - which he expects to be out on the stands by this time next year. A view of the Himalayas. The publication of your first book fetched you the State Sahitya Akademy award. What was that that journey like? I have been travelling since 1997, after some personal problems forced me to take a break from social life. During that time, I was also immersed in the study of Sanskrit dramas and epics. Before the Himalayan trek, I made frequent trips to the temples of South India and studied them. Your books are more records of ancient epics and scriptures than travelogues, which is quite different from other such books in this genre. Most of our dramas, especially those written by Kalidasa, are set in the Himalayan backdrop. Just as one tends to associate one's experiences with places and people, the chord between the Himalayan locations and the ancient texts naturally surfaces. And when that happens, it is akin to being transported back to the era when the texts were written or rather you see the terrain through the eyes of the author. 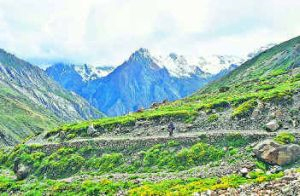 This, along with the enigma of the ranges, prompts you to look for the underlying bond you share with the eerie silence of the Himalayas and panoramic view of the area. At times, a few of your experiences narrated in the books edge on mysticism. My experience is nothing when you compare it with those who have trekked the Himalayas, especially from other countries. I have received calls from my readers, most of whom have received the books well. The second book, on my sojourn in the Uttarakhand area, has undergone four impressions in a year's time. Some of my readers also advise me to refer to other books they have read on the topic. There is much research on topography, lifestyle as well as history in the books? How do you plan the trips to get so much information? There is a lot of effort that goes behind the making of a book. I stay at the place till I catch hold of the official records on the topic or interview relevant people. For just a paragraph in one of my travelogues, I had to make a 15-day trip to Dwaraka, where under-sea explorations were on. And during the trips, I come across very interesting pieces of information like folk beliefs and even very ancient records on writing media other than paper. One such was during my trip to Adi Kalias, where I found a 90-year-old lady from the Kuti village, whose ancestors are believed to have inherited a leaf-inscription from none other than Veda Vyasa. Himalayas, thus, is a storehouse of information, some of which could be beliefs and others, well-founded facts. I have covered 70 per cent of the Himalayan region. My next trip would be to the Panch Kailas region near the Himachal ranges. But before that, I need to work on the compilation of my third book, which is now being serialised in a magazine.